Every woman needs a stylish yet functional crossbody purse that can be used as a daily travel bag or for a night out. The Dakine Jo Jo women’s crossbody bag has that unique balance between functional and fashionable. This casual women’s crossbody bag is a perfect everyday purse with its low-profile design and a fully adjustable crossbody shoulder strap. It is easy to use, incredibly attractive, made from high-grade materials, and professionally assembled, allowing it to withstand and hold up to frequent use. The Jo Jo follows the lead set forth by Dakine’s popular Jive model, but offers more value, space, and flexibility. The Jo Jo can fit your iPad, tablet, or other mobile device, but also has enough space for personal items. The multiple internal and external zippered pockets will allow you to stay organized and keep your valuables safe. Like other exceptionally made Dakine products, this stylish travel tote is made of durable 600D Polyester. 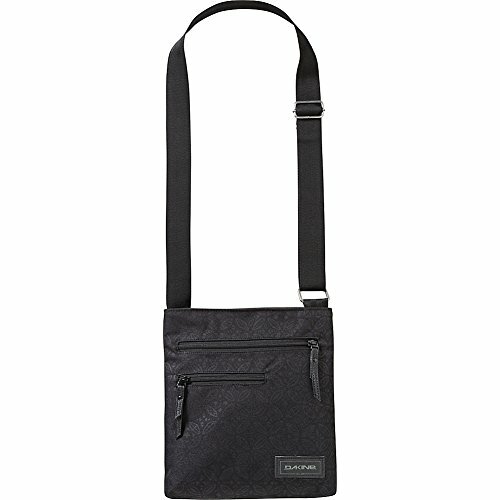 The crossbody strap length measures 28” to 55” for maximum flexibility and ease of use. Maintaining the Dakine Jo Jo is simple, as daily adventures can get messy and unexpected. If your Dakine bag gets dirty, simply hand wash it with mild soap (like Nikwax Tech Wash), cold water, and a soft bristle brush. You can depend on the Dakine Jo Jo crossbody bag to stand up to anything you throw at it, and it’s also backed by Dakine’s lifetime limited warranty. FASHIONABLE & FUNCTIONAL: Dakine's Jo Jo Women's Crossbody bag is elegantly designed yet functional for everyday use. ADJUSTABLE CROSS-BODY SHOULDER STRAP: The Jo Jo is a casual crossbody purse that is comfortable to carry and perfect for weekdays and weekends. FITS TABLETS: The 10" x 11" interior dimensions will fit common tablets and most mobile devices. This purse is the perfect size to be used as a personal travel bag. EXTERNAL & INTERNAL POCKETS: The Dakine Jo Jo handbag has both internal and external zippers that will keep your personal items organized and safe. EASY TO MAINTAIN AND CLEAN: If your Dakine shoulder bag gets dirty, simply hand wash it with mild soap, cold water, and a soft bristle brush. You can depend on the Dakine Jo Jo tote to stand up to anything you throw at it, anywhere you travel.